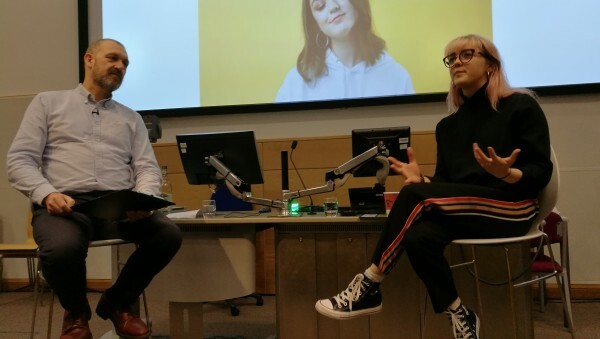 Maisie Williams, most famously known for her character Arya Stark in HBO’s Game of Thrones, spoke to a sold-out crowd this afternoon at Manchester Metropolitan University. Explaining her newest venture, Maisie spoke about the newly launched platform ‘daisie’. The App aims to become a central social platform for creatives of all mediums to come together, share and collaborate. The initial concept for daisie came from a discussion between Maisie and film producer Dom Santry. The two had developed a good working relationship during production of iBoy (2017), so began working together again to realise this vision of a ‘social media for artists and creatives’. Starting as a platform solely for filmmakers, Maisie and Dom quickly realised the true expansive nature of the creative industries. The App today prides itself on inclusivity and diversity within the creative world, in particular giving credit where credit is due on collaborative projects. The algorithm built for daisie focuses on a user’s proactivity and community involvement, as opposed to purely follower numbers to gauge how successful an individual's account would be. Through this technique, Maisie hopes daisie will help eliminate the aspect of 'it’s not what you know, it’s who you know,' in breaking into creative industries. Maisie encouraged the audience of mostly creative students to create just because they can whilst still at University. The daisie platform will be of particular interest to creatives at the start of their careers or still in study. As budding creatives strive to find a place in an increasingly crowded market, Maisie hopes the platform will alleviate some of the pressure. Currently available for Apple devices on IOS, daisie will be expanded to further systems such as Android in the near future. The next build of daisie is expected to be released in April this year.